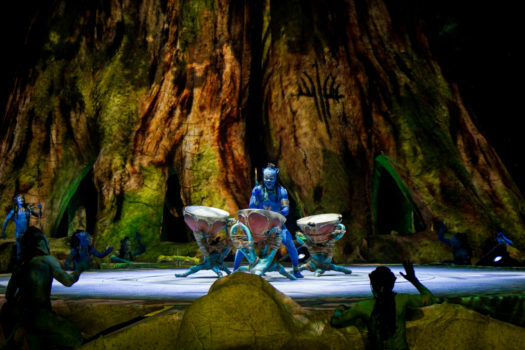 Cirque du Soleil’s Toruk- The First Flight recently had a run at Intrust Bank Arena in Wichita, Kansas as part of its North American tour. I had the chance to attend a show and was amazed at this theatrical production. This visually stunning performance takes over 25 semi trucks full of props and equipment to put things together. After watching the performance I know why. As you read other reviews, I am sure everyone will be different as to how they interpreted the show. One thing I am sure we will all will agree on is the splendor of the scenery and special effects. Set thousands of years before AVATAR on the planet Pandora, the story follows two young Omatikaya boys who have to find Toruk to help save the Sacred Tree of Souls, after the Shaman has a vision of molten lava threatening to destroy it. As the boys travel in search of the great bird Toruk, they encounter various tribes along the way. Each scene is full of color and brilliance and include the talented Cirque du Soliel acrobats performing mesmerizing stunts indigenous to their tribe. The visual effects include whimsical creatures, earthquakes, waterfalls, lava, oceans, forests and more. 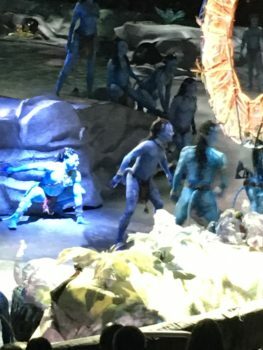 The added addition of the story teller helps to narrate what is happening as the show as it is spoken in the Na’Vi language. 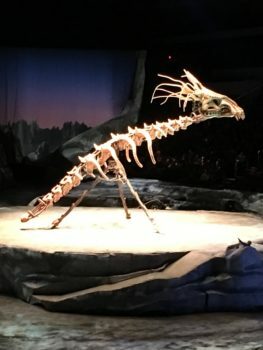 The option of downloading the TORUK app allows the audience to interact at certain times during the show. A notification from the app gives instructions on what to do. 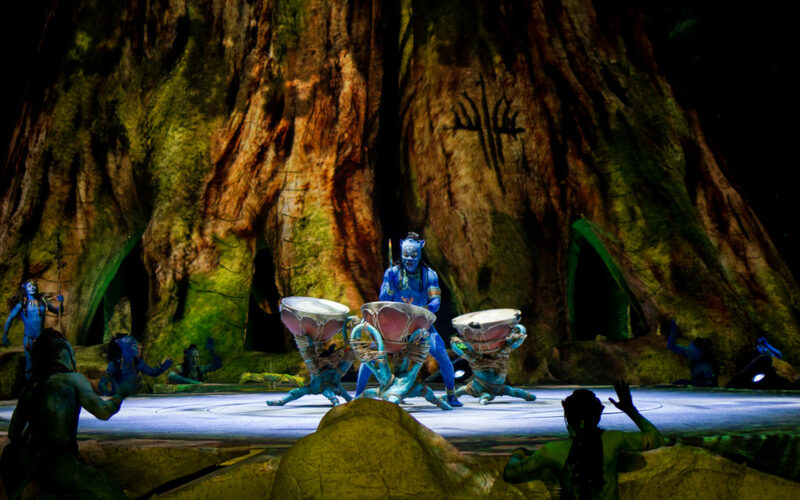 Avid fans of James Cameron’s AVATAR will certainly enjoy the detail costuming of the Na’Vi people and culture as he helped with the production of this show. Although having the narrator helped, at times I found it a little hard to follow. However, I thoroughly enjoyed the magnificent talent of the acrobats and performers. The costumes, scenery and visual effects are like nothing I have ever seen and certainly up to par in comparison to the their flamboyant and extravagant Vegas style shows. In addition to all of the props and equipment, this show is literally a traveling city with mobile kitchens and more including doctors on staff to assist the cast and crew when medical care is required. For more behind the scenes look at what it takes to put on this show you can read this behind the scenes post. For a list of city and tour dates for the show visit the Cirque du Soleil website. 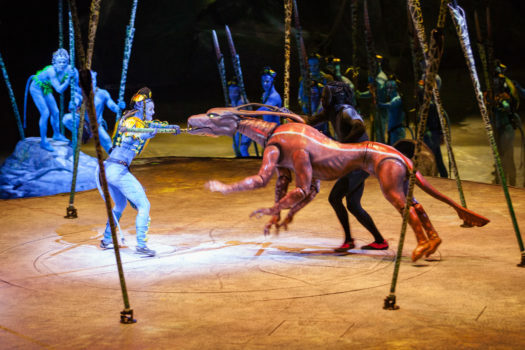 This behind the scenes look at Cirque du Soleil’s TORUK – The First Flight is a mythical tale set thousands of years before the events depicted in the film AVATAR, and before any humans ever set foot on Pandora. 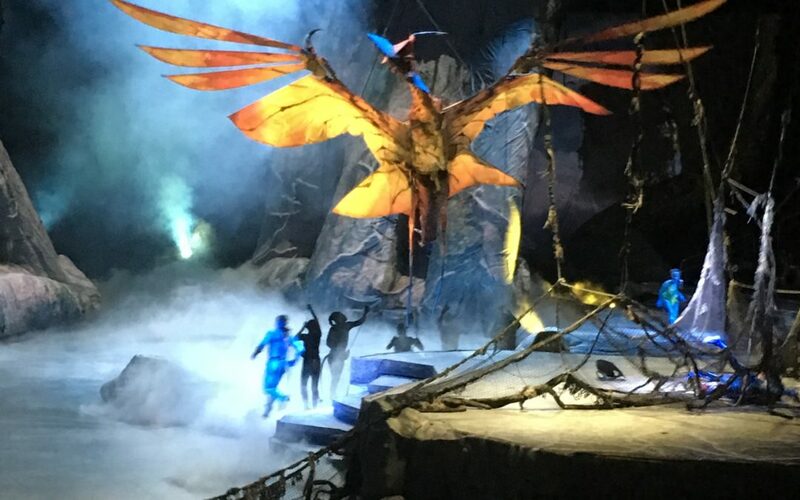 TORUK – The First Flight is a traveling Cirque du Soleil show that takes over 25 semi trucks full of props and equipment to pull off this visually stunning show. 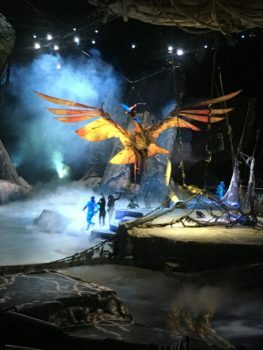 From video production to costumes and make-up, TORUK – The First Flight is a multimedia phenomenon. Here are some fun facts from the media kit I received about what it takes to put on the show. 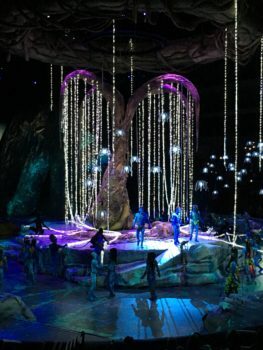 Pandora in All Its Splendor – Lemieux and Pilon, who also wrote the show, sought to convey the awe-inspiring beauty and vital impetus of the world of Pandora – Its rich textures, lush flora, and youthful buoyancy. The multimedia projections that evoke the awe-inspiring landscapes – from the Floating Mountains and the Omaticaya Hometree, to the Anurai’s animal sanctuary and the lush jungles where the Tawkami live – create a visually stunning environment for the performers. So do the large-scale effects that come from the storyline, such as the earthquake and volcano eruption, the rivers of lava rising from within, and the Shaman’s visions projected on a huge floating, ethereal veil. • Total projection surface, excluding projections that reach out into the audience, is approximately 20,000 square feet, more than five times the size of a standard IMAX screen: 12,750 for the stage, 3,600 for the two lateral screens, and another 3,600 for the two columns of Hometree. • There are 40 video projectors in all: half are 30,000-lumen each, the other half, 20,000-lumen. • 22 video projectors are used for projections on the ground; 6 projectors send video images on Hometree; 2 projectors are dedicated to the two lateral screens and 8 projectors are used for immersive projections into the audience. The Omaticaya Hometree – On Pandora, Hometrees are two to three times the height of the redwoods that once covered the Pacific Northwest on Earth. The bottom part of the columns of the Omaticaya Hometree loom 25 feet above the stage floor. Amid the bustle of daily life inside Hometree, one can see a Giant Loom – a kind of weaving machine that plays an important role in the daily lives of the Omaticaya. The Green Belt – The terrain on Pandora is neither smooth nor flat. To create a fragmented topography that evokes the uneven landforms on Pandora, the Set. Designer created an elevated, padded bank – or Green Belt – all around the stage on which performers can climb and move around. The Green Belt ensures that images projected on the ground look more three-dimensional. It also doubles as a cover for the rink board. As Pandora is a world lush with vegetation, three dimensional retractable plants pop out of the Green Belt during scenes to evoke the forest environment. • The show’s performance area is based on the Fibonacci spiral. This shape is determined by the ancient number sequence in which each number is the sum of the two preceding numbers. It is said that botanists on Pandora have recognized this mathematical pattern in many botanical specimens with a fiddlehead shape. If one were to place the design of the Fibonacci spiral on the stage, the Tree of Souls would be in the exact spot at the heart of the spiral. • Hometree is 80 feet wide by 40 feet high. The structure is equipped with wheels and stands on nine pivots. It can be moved by hand. • The fabric that covers the entire performance area used as a projection surface during the Prologue comes in two parts, each measuring 200 by 90 feet wide. Since the movie is set 3,000 years in the future in relation to TORUK – The First Flight, the Costumer Designer needed to determine how the Na’vi’s clothing culture had changed over that period of time and, working backwards, create her designs accordingly. The Omaticaya’s domestic culture revolved around weaving and bead-making and using the things they found in their natural surroundings – from seeds and vines and leaves, to bones and precious stones. her ornaments and treasures that she has incorporated into her ceremonial robe. The “Fabric” of Pandora – The costumes should look like they were made by Na’vi hands, hence the organic, handmade look to the wardrobe. Textures and prints were designed to overcome the fact that there are no fabrics on Pandora. The artisans in the costume department sought out materials that potentially looked like they were naturally available to the Na’vi in their environment. They “invented” Pandoran fibers that do not exist on Earth. Some varieties of “extraterrestrial flora” used in the costumes are in reality cut-outs of loofah sponge or molds from cabbage leaves. A loincloth that looks like it was made from leaves is in fact made of crinoline, an open-weave horsehair and linen fabric usually stiffened and used for interlinings, skirts or underskirts. • As the base costume represents the bare skin of the Na’vi, the footwear has to imitate bare feet. The artists wear shoes contoured to the shape of the human foot, including visible individual sections for the toes. • The flowers of the Tawkami costumes require 437 yards of fabric and 120 fishing rods. • Some costumes are made with parts of hammocks. • Bones were used as an inspiration to sculpt the Anurai decorations and to adorn the corset of the Storyteller. • A drill or a hand mixer is used to prepare the wool materials that make up the braids in the hair of the Omaticaya characters. • As turquoise silkscreen inks are extremely sensitive to sunlight, all costumes with this feature need to be covered with a black garment bag during storage. • The black-clad, shadow-like puppeteers who personify the spirit of Eywa are a direct reference to the shadows in Plato’s “Allegory of the Cave.” Shadow play is a precursor of cinema. • There are 115 costumes in the show, an average of 3.3 costumes per artist. The costume department produced more than 1,000 items in all, including shoes, headpieces and necklaces. When he dreamed up AVATAR, James Cameron created a coherent, highly structured world with its own set of codes and natural laws, including a living, breathing ecosystem with an exotic fauna. they could easily have turned to animatronics – animal figures animated by means of electromechanical devices. Instead, they chose to create bona fide puppets where the strings, rod or controls are intentionally left visible and the puppeteers are in full view. Regardless of the technique, the goal remains to urge the spectator to suspend disbelief for a moment – to create the illusion that these are not mere objects made of metal and cloth, but living beings from a faraway moon. “On Pandora, the animals are strange, menacing and beautiful all at once. These six-legged muscular creatures exude a sense of grace and nobleness, which I wanted to convey. I wanted my designs to be a tribute to nature, as is the show,” says Puppet Designer Patrick Martel. • The puppeteers are equipped with microphones and make their own animal sounds for perfect synchronization with their movements. The creative team wanted to convey the strength, physicality and agility of the Na’vi a setting that takes into account Pandora’s weaker gravity compared to Earth’s. Acrobatics are embedded in the storyline and the artists’ every move – from leaps and tumbles, to flips and somersaults. The stage floor was specially equipped with rebound surfaces to allow the artists to generate thrust and build momentum. had just walked out of the big screen. Omaticaya – Giant Loom & Vines The giant loom that holds a special place in the everyday lives of the Omaticaya doubles as an apparatus. Artists climb up the structure and leap from one bar to the other, performing moves that borrow from various aerial acrobatic disciplines. and Tsyal, the kites become characters in their own right. Tipani – Poles and Staffs Valiant warriors, the Tipani are deft at manipulating poles and staffs during symbolic or ritual battles. Tawkami – Pandoran Flora As for the Tawkami, proficient botanists known for their vast knowledge of plants and their healing properties, the oversize flora of Pandora serves as a showcase for the clan’s special abilities. Searching for potent seeds, Tsyal climbs up the pistils of an enormous flower suspended from above and performs moves that have all the earmarks of an aerial silk act. During the Tawkami scene, members of the clan celebrate the harvest by performing a balletic “floral” choreography: they manipulate banners made of ultralight fabric that evoke colorful leaves, plants and flowers, creating huge volumes that flow and undulate gracefully in space. • There are 18 kites in the show: 6 quads (kites equipped with four-line), 11 kites on poles, and 1 giant traction kite. • During the scene in the Hallelujah Mountains, the 64,5-square-foot giant traction kite flies out over the audience. Spectators sitting up close can feel the gust of wind the kite makes as it whooshes by overhead. • Traction kiting is an extreme form of kite flying. A traction kite is typically large enough to pull a vehicle on land, snow, ice or water. Since there is no wind indoors, it is the flyer who must generate the energy required to fly the kite. Interestingly, a traction kite that is flown indoors has the ability to glide forward just like a paper plane. • During the Kekunan Clan scene, a group of 12 kite flyers perform simultaneously on stage. Composers and Musical Directors Bob & Bill had to meet the challenge of creating otherworldly music that captures the vibe of Pandora, in addition to composing cinematic-sounding transitions between scenes that blend perfectly with the “Na’vi” sound. The composers lugged their equipment out in the woods to record the beats for the show’s soundtrack in order to achieve as natural and organic a sound as possible. Instead of using drumsticks to compose the different rhythmic patterns, the composers used objects or phenomena in nature – footsteps on dry leaves, a stick hitting the trunk of a tree, a branch slapping the ground, etc. Many of the beats recorded in the woods were used as is, and not as mere samples doctored in the studio. In addition to coming up with an overall show sound, Bob & Bill created a specific signature for each of the five clans, each with its own theme, timbre, instruments and voices. Even the fierce predator Toruk has its own unmistakable two-note theme. 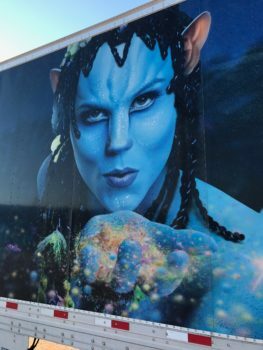 The composers turned to Paul Frommer – the linguistics expert who invented the Na’vi language for James Cameron’s AVATAR – to translate into Na’vi the lyrics to all of the songs written for the show. Bob & Bill also drew inspiration from the musical instruments and theory explained in-depth in the Pandorapedia, James Cameron’s official field guide to the world of AVATAR. sounds of the village were used to create beats. • World renowned countertenor Daniel Taylor lent his voice to create the signature sound of the noble Anurai. Hollow sticks were used to create beats associated with these hunters who live in an animal sanctuary littered with animal bones. pre-recorded soundtrack that makes up the show’s soaring cinematic score. Soleil, and James Cameron, Jon Landau, Kathy Franklin and Richie Baneham for Lightstorm Entertainment.